How to solve RSA Algorithm Problems? The Transmission Control Protocol is the most common transport layer protocol. It works together with IP and provides a reliable transport service between processes using the network layer service provided by the IP protocol. TCP provides process to process communication, i.e, the transfer of data takes place between individual processes executing on end systems. 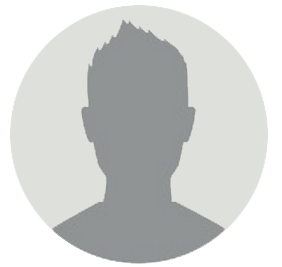 This is done using port numbers or port addresses. Port numbers are 16 bit long that help identify which process is sending or receiving data on a host. This means that the data is sent and received as a stream of bytes(unlike UDP or IP that divides the bits into datagrams or packets). However, the network layer, that provides service for the TCP, sends packets of information not streams of bytes. Hence, TCP groups a nuber of bytes together into a segment and adds a header to each of these segments and then delivers these segments to the network layer. At the network layer, each of these segments are encapsulated in an IP packet for transmission. The TCP header has information that is required for control purpose which will be duscussed along with the segment structure. This means that the communication can take place in both directions at the same time. TCP is reliable as it uses checksum for error detection, attempts to recover lost or corrupted packets by re-transmission, acknowledgement policy and timers. It uses features like byte number and sequence number and acknowledgement number so as to ensure reliability. Also, it uses congestion control mechanisms. TCP does multiplexing and de-multiplexing at the sender and receiver ends respectively as a number of logical connections can be established between port numbers over a physical connection. All the data bytes that are to be transmitted are numbered and the beginning of this numbering is arbitrary. Sequence numbers are given to the segments so as to reassemble the bytes at the receiver end even if they arrive in a different order. Sequence number of a segment is the byte number of the first byte that is being sent. Acknowledgement number is required since TCP provides full duplex service. 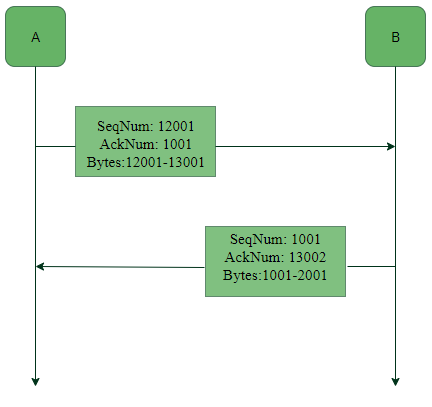 Acknowledgement number is the next byte number that the receiver expects to receive which also provides acknowledgement for receiving the previous bytes. In this example we see that, A sends acknowledgement number1001, which means that it has received data bytes till byte number 1000 and expects to receive 1001 next, hence B next sends data bytes starting from 1001. Similarly, since B has recived data bytes till byte number 13001 after the first data transfer from A to B, therefore B sends acknowledgement number 13002, the byte number that it expects to receive from A next. The header of a TCP segment can range from 20-60 bytes. 40 bytes are for options. If there are no options, header is of 20 bytes else it can be of upmost 60 bytes. 16 bit field that holds the port address of the application that is sending the data segment. 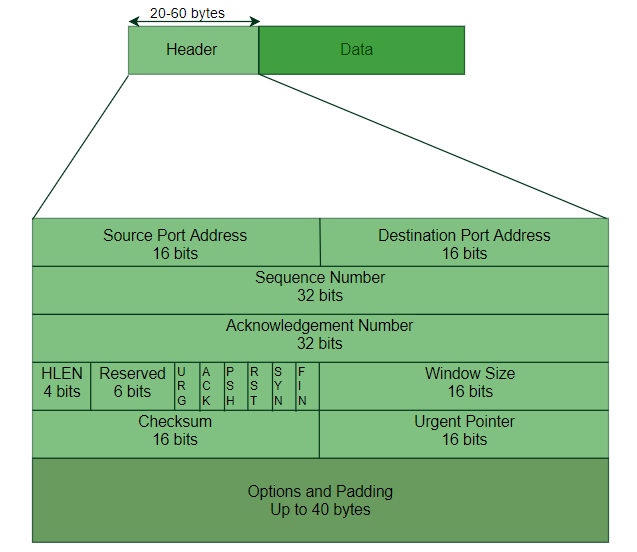 16 bit field that holds the port address of the application in the host that is receiving the data segment. 32 bit field that holds the sequence number, i.e, the byte number of the first byte that is sent in that particular segment. It is used to reassemble the message at the receiving end if the segments are received out of order. 32 bit field that holds the acknowledgement number, i.e, the byte number that the receiver expects to receive next. It is an acknowledgment for the previous bytes being received successfully. This is a 4 bit field that indicates the length of the TCP header by number of 4-byte words in the header, i.e, if the header is of 20 bytes(min length of TCP header), then this field will hold 5 (because 5 x 4 = 20) and the maximum length: 60 bytes, then it’ll hold the value 15(because 15 x 4 = 60). Hence, the value of this field is always between 5 and 15. This field tells the window size of the sending TCP in bytes. This field holds the checksum for error control. It is mandatory in TCP as opposed to UDP. This field (valid only if the URG control flag is set) is used to point to data that is urgently required that needs to reach the receiving process at the earliest. The value of this field is added to the sequence number to get the byte number of the last urgent byte. TCP is connection oriented. A TCP connection is established by 3-way handshake.